A flavour of the Caribbean came to Aldwick with the visit of touring side Trinidad & Tobago a day after they had competed against Minor Counties side Berkshire at Ascot. The tourists opened the bowling with Sedgefield Sobers, who removed opener Leigh Monk (12) in a tidy seven-over spell (1-31). Monk’s opening partner Tom Hoare (18) made an early valuable contribution but like many of his team-mates he got out just as he got going. 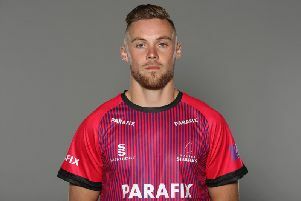 Ollie Smith (32) top-scored in a par final total of 152-9 from 35 overs, however the veritable highlight of the innings was when Monk, fielding for the opposition whilst an injured player was off the field, took an unbelievable catch to dismiss his team-mate Harry Rosser (14). Monk gets married on October 1 and his best man is .....Rosser. T&T’s bowlers shared the wickets around but the best performer was Marcus Ramnath with 3-23. Aldwick used 11 bowlers in valiant attempt to restrict the talented touring side batsmen but Greg James made his mark with a unbeaten 71 and victory came in the 32nd over by six wickets. Aldwick’s wicket-takers were Liam Hicks (1-15),George Nottingham (1-11), and Ian Guppy (1-22). After the game, the tourists presented the hosts with a commerative plaque and something from the Carribean – a large bottle of white rum! For only the third time this season Emsworth won the toss – and on a greenish soft wicket, they decided to bowl first. It appeared to be a good decision as Rob Norris and Ant Norris opened the bowling and reduced Colden Common to 7-4. A little recovery by Colden Common’s captain was halted by Lee Gray with two wickets in two balls to reduce them to 47-6. Colden Common tried again to rebuild their innings with runs slowing down. Lewis Roberts and Mike Offord each picked up a wicket before Ant and Rob Norris returned to bowl Colden Common out for 110. Rob Norris picked up 4-23. James Swaine and Mike Norris opened in the reply but Norris was bowled early, bringing Barrie James to the crease. Swaine looked in very good form and put the ball to the boundary regularly. A 100 partnership was made and Emsworth got over the line in the 22nd over with Swaine 66 not out. Emsworth remain unbeaten and top of the table. Lavant won the toss and invited Lynchmere to bat. Batting proved difficult on a soggy pitch with a wet outfield. Lynchmere lost their first wicket to the first ball of the innings and, with the ball hardly leaving the square, Lynchmere opted for the aerial route to score runs. However, some fine catching by the Lavant fielders at deep mid-on and mid-off saw Lynchmere tumble to 39 for seven with Ian Rawnsley causing most of the problems with a fine spell of four for ten. The fall of the seventh wicket brought in the experienced Simon Cain, who with Martin Brown and the injured Chic Charman, who batted with a runner, took the score to 89 all out. Lavant, mindful of a poor performance the week before, realised that the last-wicket stand had doubled Lynchmere’s score. Lavant’s reply started poorly and quickly fell apart – all the batsmen struggled to score as Cain produced an excellent four for nine. Only the ever-reliable Steve Brooker reached double figures and he was left stranded on 15 not out as the wickets tumbled at the other end, with three of Lavant’s batsmen out for a duck. Lavant were 54 all out, an even worse performance than the previous week. On a glorious afternoon Goodwood entertained the Royal Household Cricket Club for the first time. RHCC brought some 40 supporters with them. RHCC elected to bat and made 34 before Pete Lamb bowled classy opener S Enson for 13. D Bense struck 24, P Hutchinson 27 and a well-manufactured innings of 79* by D Skirrow boosted the total to 177, perhaps just below par. Pete Lamb (1-21), Mike Smith (0-13), Johnny Heaven (2-30), Hari (0-23), Richard Geffen (3-29) and James Mayne (3-15) all bowled well. Opening RHCC bowlers B Roberts (1-11) and C Hollingworth (1-25) bowled quickly, making runs very hard to come by. Of the top six only Mike Smith came to terms with the RHCC bowling and made a classy 75. It was left to the lower order to try to bring the game around, as they had in the past two games. Tim Odell (10) supported Smith well and when they both departed Heaven (26) and Mayne (11) came together. But Heaven was caught at long-off going for the second successive six and the Goodwood chairman ran out young Stanley Mayne, who had had a great game, RHCC ran out winners by 21 runs. The difference was two outstanding catches – by S Enson at short mid-wicket to dismiss Steve Dudman and D Winters at slip to see off James Mayne. For RHCC, A Cornwall took 4-24. It was a week to remember for Bognor’s under-14s who as well, as winning their festival week group went on to win the final against Southwater at East Grinstead. The week commenced well with victories over Littlehampton and Chichester. A maiden century for Charlie Jays and quick runs for Ben Woolnough were coupled with wickets for Ben Taylor against Littlehampton with Taylor and Taylor Jaycocks providing the backbone of the innings in the Chichester victory. A loss to Eastergate and a draw against Middleton were enough to see Bognor through to the final where they met Southwater. A solid 61 from Elvis Millen saw Bognor to 164-9 off of their 40 overs but the bowlers were the stars of the show; Millen bagged 3-7 and Ben Woolnough 3-6 as Southwater were bowled out 66, Bognor winning by 98 runs. The hosts invited the visitors to bat on a glorious day. Openers Mike Delaney (28) and Tom Woolnough (47) gave Bognor a good platform which Jamie Woolnough took on, making a fine 99 not out. With support from Darren Coombes (32 not out), the Rebels finished on 225-4. Experienced Burpham wrestled back the initiative as Alan Budd (50), Richard Diplock (77) and Mark Barry (54no) made Bognor’s youngsters and ladies run around and take the win by secen wickets. For Bognor, Jamie Woolnough bagged all three wickets. A glorious day heralded the annual charity match between Kirdford and the Peacock family – funds being raised going towards much-needed work on the village recreation ground. Around 80 to 90 spectators watched on as the Peacocks batted first and posted a challenging 108 on a bowler-friendly pitch. Kirdford’s response was measured, and at 50 for two with Simon Johnston (25) going well they looked to be walking it. However an excellent spell of bowling some of the slower Peacock bowlers led to a Kirdford collapse and a loss by 14 runs. A barbecue followed and the village festivities ended as the sun went down.